Threatening to break a kafir’s mouth is ok; it’s the kafir’s reporting of the threat that makes the community unsafe. Facebook has banned Frontpage Editor and Glazov Gang host Jamie Glazov for seven days. 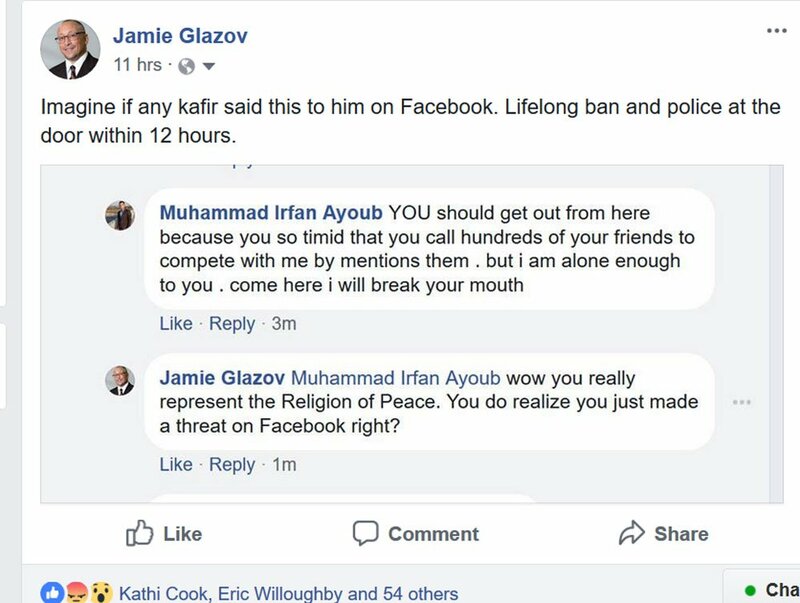 Jamie's crime is posting/reporting on his Facebook page a physical threat that was made to him personally on his FB page by a member of the Religion of Peace. 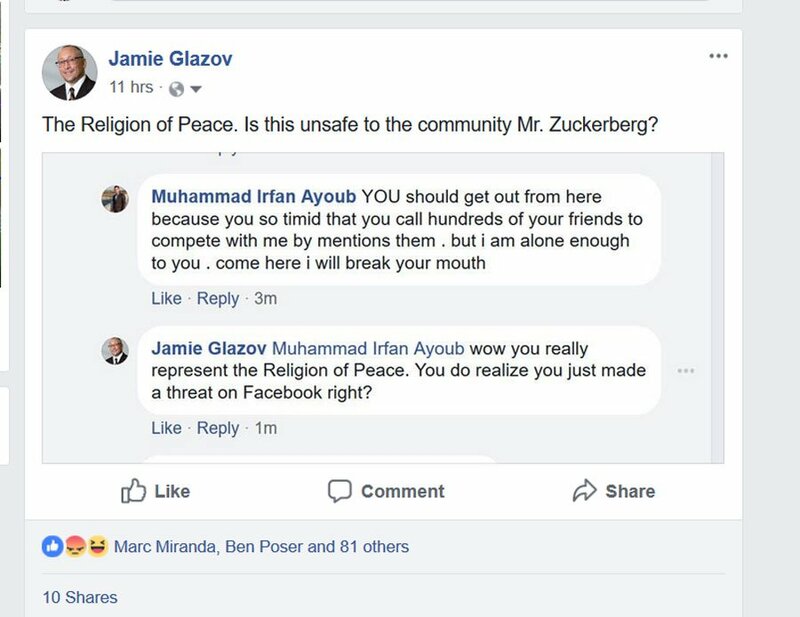 Jamie then made two posts about this threat, showing the screenshot of it and (1) asking Mark Zuckerberg if Ayoub's threat is unsafe to the community and (2) pointing out that if a kafir (Islam's secret dirty word for the unbeliever) said this to Ayoub on Facebook that there would be a lifelong ban and police would be at the kafir's door within 12 hours. Facebook has not responded to Jamie and the ban remains in place. 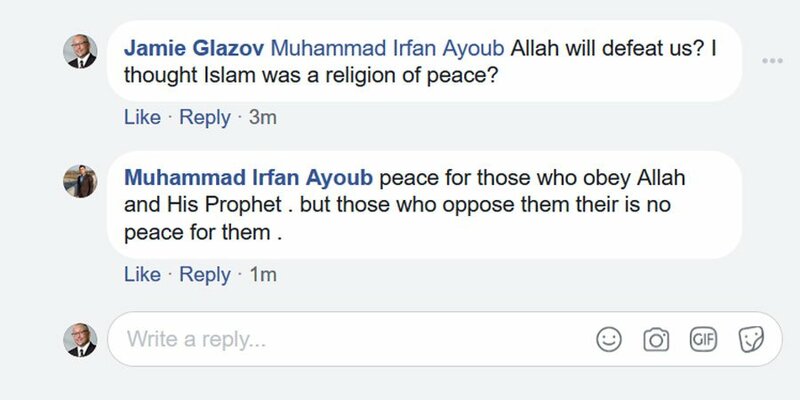 It is now obvious what the rule is at Facebook: If a member of the Religion of Peace threatens to break a kafir's mouth, that is safe for the FB community and the kafir obviously deserves the threat because he is violating Islamic blasphemy laws in some way. And the kafir must be punished if he reports or complains about the threat. But if a kafir says something about Islam that upsets a Muslim, then that is a completely different matter. That for sure is unsafe for the FB community and the kafir obviously needs to be punished. The thread on which all of this occurred is a video post by Jamie of human rights activist Anni Cyrus telling her personal story of being a child bride under Sharia in Iran -- and how she was able to escape the barbarities of Sharia. Anni discusses how little girls are being literally sold every day into sexual slavery under Islamic law. See the video post and discussion thread HERE before Facebook might take it down. 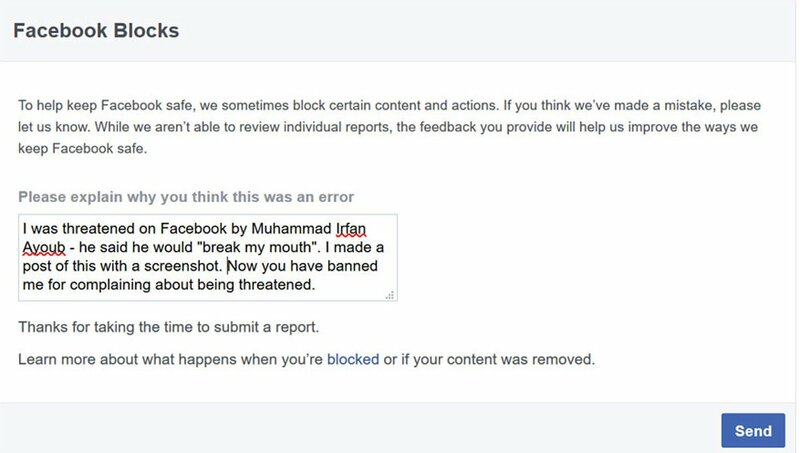 We request that everyone who cares about free speech and who is concerned about Facebook's surrender to Islamic blasphemy laws, to protest this shameful and shameless banning of Frontpage's Editor and also Facebook's overall persecution of truth-tellers about the totalitarian and terrorist threat our civilization is facing. Please share this article and this news everywhere, write to Facebook (on Facebook and on Twitter at @fbnewsroom @facebook) to protest its banning of Jamie and its surrender to Sharia, and encourage everyone to do the same.